If you happen to find yourself in Milan, Italy, with a little time to spare (after you've climbed to the roof of The Duomo) then a trip to the Museum of Science and Technology Leonardo da Vinci is worth considering. Just a stone's throw from the Basilica of S. Maria delle Grazie, which houses Da Vinci's masterpiece The Last Supper, the Museum houses a range of treasures, including a marvelous collection of models based on the drawings of Leonardo da Vinci. 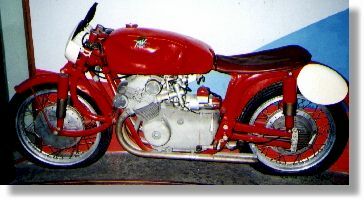 Its collection of early motorcycles is modest in number, but quite impressive in quality. 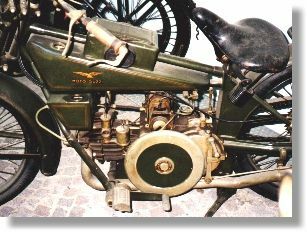 At the early end of things, I was taken by a delightfully original Georgia-Knap, with its motor mounted against the rear wheel which it drives by gears. The other dozen or so bikes represented a good cross section of motorcycle history. FN, Della Ferrera, Moto Guzzi and so on. 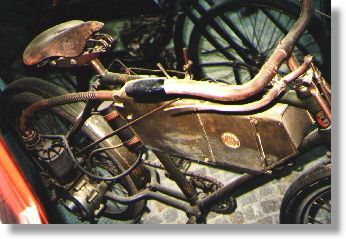 Quite different from the usual bikes seen in Australian museums! But without doubt the highlights of the collection are housed in a small room hidden from the main hall. 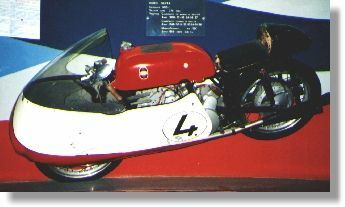 Together with a couple of earlier record-breakers are a pair of bikes representing the cream of Italian racing motorcycles: an MV four and a Gilera four. I have to admit, though, that the dust, the pilfered bits, and the flat tyres detracted from the display. The bikes deserved better than this: perhaps a rotating display stand in the foyer.